Go wild for this zebra cookie recipe, with the perfect blend of dark and white chocolate. Beat Country Crock® Spread with sugars until light and fluffy in large bowl with electric mixer, about 5 minutes. Beat in egg and vanilla, scraping sides occasionally. Gradually beat in flour mixture until blended. Stir in 1 cup EACH semi-sweet and white chocolate chips. Drop dough by heaping tablespoonfuls, 2 inches apart on prepared baking sheets. 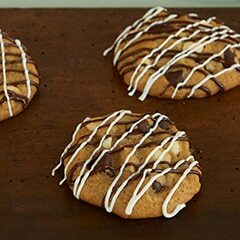 *ZEBRA DRIZZLE: Melt 1 cup EACH remaining semi-sweet and white chocolate chips; drizzle over cookies. By using Country Crock® Spread instead of butter in this recipe, you reduce the amount of saturated fat by 1.5g and save 10 calories per serving.